These job seekers made resumes that recruiters couldn't ignore. Many people see job search as a numbers game: if you apply to enough companies, you'll eventually get hired. The consequences of that strategy range from the boredom of a repetitious application process, to getting few responses from recruiters, to not feeling any progress in general and ultimately, taking the first offer that comes along, often from a company that you have no clue if you want to work at. Instead, smart job seekers research a few potential employers and roles as early as possible in their job search, and then focus on them directly. It makes a lot more sense. At the very least, they'll create a targeted resume, meaning a resume that's tailored for each employer and job opening. You might think that would be enough, but some job seekers take it to another level and tailor their entire job search for the job they want. They put it in a lot more work up front, but when done well, the odds of getting more and better recruiter responses goes up a lot. Here are 17 examples of job seekers who did just that. What they did: To impress the Editor-in-Chief of the UK version of GQ magazine, Sumukh Mehta made a 20-page resume styled just like an actual edition of GQ. It took him more than 3 weeks to make. Did it work? YES. It worked so well, he was offered a job immediately, without even being interviewed. What they did: Copywriter Chase Zreet loves Sprite and wanted to work on their ad campaign, run by Wieden + Kennedy New York. To get their attention, he sent in a cover letter like any other job seeker… except that his cover letter was a video of him rapping about Sprite and why he could write great ads for it. Did it work? YES. The video has almost 1M views and Zreet started working at Wieden + Kennedy in April 2018. What they did: When Hanna Phan saw a job opening at SlideRocket (now part of ClearSlide), she used their own product to make a “presentation resume” video about why she would be a great fit. Her story went viral and inspired others. Did it work? YES. She was hired as a Product Manager at SlideRocket in September 2011. Not only that, but 2 months later, SlideRocket announced “Présumés”, presentation templates that make it easy for job seekers to copy Hanna's idea. Reading between the lines, it sounds like the company loved her idea so much, they hired her to create the product for others. What they did: To get a job at Amazon, Philippe Dubost put his resume online, making it look like he was a product being sold on Amazon. Did it work? YES. Two months, 1.5M visitors, a lot of online coverage and 150 (that's 1-5-0) job offers later, he decided to join a startup called Birchbox. He then updated the resume to say that he's currently unavailable. 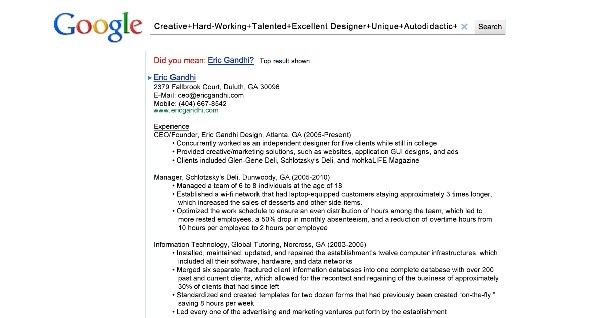 What they did: Eric Gandhi wanted a job as a designer for Google, so he designed his resume to look like a Google search results page and sent it in. Did it work? YES. “Within 30 minutes of applying with this resume for a designer position on Google’s website, Eric got a call for an interview and was offered a marketing position in the end” which he turned down because it wasn't design-oriented enough. However, after also posting the resume on his website, it went viral, attracting interviews from employers and he quickly got hired. What they did: Matthew Epstein wanted to work at Google so badly that he created a website called “Google, please hire me. Matthew Epstein.” with the above video resume. Did it work? YES. While Google did interview him, they didn't hire him. However, his video went viral, getting over 450K views and attracting over 80 interview offers. It took him only 3 weeks to accept his dream job offer at a San Francisco-based startup. What they did: To get Pinterest's attention, Jeanne Hwang Lam put her tailored resume online in the form of the ‘JEANNE | for Pinterest!' pinboard. Did it work? YES. Pinterest contacted her, and although they didn’t hire her, her pinboard resume did net her job offers from other companies. What they did: Alice Lee wanted a job at Instagram so badly that she created DearInstagram.byAliceLee.com, a website showing a combination cover letter/resume infographic explaining what she would bring to the company. Did it work? YES. Instagram founder Kevin Systrom called Alice, and although they didn't hire her, the viral buzz she generated directly led to a job at another company. What they did: After spending a year playing the numbers game mentioned above and applying for hundreds of openings and getting nowhere, Nina Mufleh changed her strategy. Her “goal was to focus on only one result: getting a job with a high impact team where I can do really cool work.” She aimed for Airbnb by building a website where she analyzed the global tourism market and suggested where Airbnb should focus next. And of course, the site was styled to look like a page on Airbnb.com. Did it work? YES. 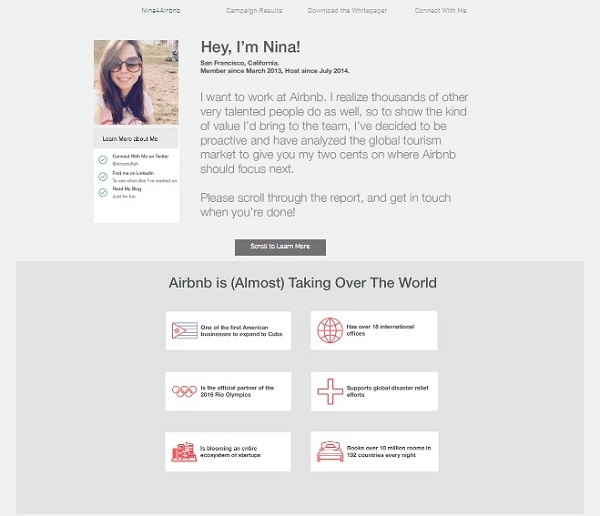 Nina4Airbnb went viral, attracting dozens of job interviews including with Airbnb. Although she was disappointed by them, she quickly got hired at Upwork.com (one of the top freelance marketplaces online). What they did: Hoping to get a job at surfing company Quiksilver, Thomas Groc created his online resume by copying the look of the company's official website. Did it work? YES, Quiksilver invited Thomas to a job interview. What they did: Onja Lola Delezinier applied for a marketing internship at French juice company Innocent by making her resume look like one of their bottle labels. She then dropped off the bottle and a paper CV at their offices. Did it work: NO, at first. Although Innocent were impressed by what she did, they had no marketing job openings at the time for her to fill. What they did: a few months after her first attempt to get an internship at Innocent France, Onja Lola Delezinier tried again. This time, she parodied one of their juice cartons with her resume information. Did it work? YES. This time, she did get an interview but she wasn't offered a job. What they did: Aiming for a job at advertising agency Ogilvy & Mather, Saaniya Abbas created a website with an animated resume with lots of positive words around the name “Ogilvy”. Did it work? YES and NO, according to her LinkedIn profile. Her animated resume was featured in many places online and it's around that time she changed jobs, so it seems that the buzz did help her get another job. What they did: To apply for a job as an Event Coordinator at the famous French cookie company, Margaux Barre organized an event AT the company: the tasting of a massive cookie she baked for them. Did it work? YES, she was interviewed after the event by their head of HR, although she ultimately wasn't hired there. What they did: To apply for a job at Bortársaság, a Hungarian wine distribution company, Bernadett Baji had a designer friend arrange her CV as a label for one of their wine bottles. Did it work? YES, she was interviewed and hired by the company. What they did: To apply for a design internship at Sherry Design Studios, Hannah Hughes created a unique CV based on the company's slogan: “Creativity means nothing if it doesn’t hit the target.” A USB key in the shape of an arrow, it contains her resume as an animated presentation, including a personalized message for their recruiter Chris. Did it work? YES. Their creative director contacted her right away and was very interested in having her as an intern, but another company offered her a full-time job offer in parallel and she took that job instead. What they did: Taira Perrault researched Partners + Napier and discovered that CEO Sharon Napier loves basketball, so she sent in her resume attached to a small basketball game. Did it work? YES. Napier loved the idea and Taira was later hired as an associate art director. What makes a good creative, targeted resume? 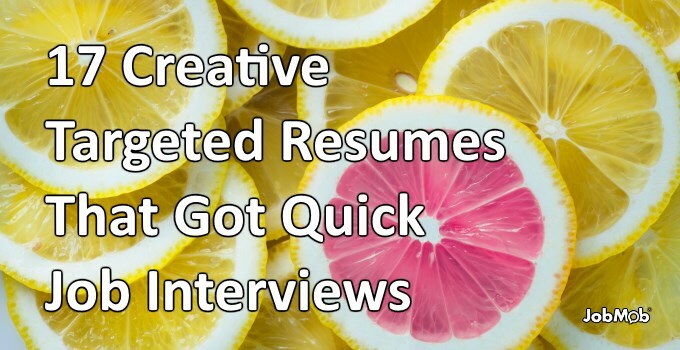 How can you create your own creative, targeted resume? Nina Mufleh's Nina4Airbnb website has a downloadable whitepaper explaining in detail how she created and managed her campaign, and there are lots of good ideas there to inspire you. Which of these resumes is your favorite and why? Do you know of any others we should add to the list? Tell us in the comments. Subscribe to JobMob via RSS or email and follow me on Twitter for the most creative job ideas anywhere. this was an excellent read/watch~!! learned so much and it really highlighted some out of the box ideas!! Thanks!! Thank you so much for this, Jacob! This goes well beyond the usual “check out those resumes ” post. I particularly liked the Amazon and Airbnb approaches because, as you point out under your conclusion point no 5, they have this great combination of skill, expertise, and creativity! Glad you liked it, Tim. Nina in particular went above and beyond, she’s a standout in this list of standouts. Employers should bend over backwards to reach out to her. Hello Jacob, thank you for including my resume in your article. I’m truly honored and blown away that it made the cut. These are all such amazing examples and true inspiration for anyone trying to land a job of their dreams. Very cool of you to come by. Such a great job search story, it was easy to include you and you’ll definitely inspire others. Well done!